Diapason Astera review | What Hi-Fi? Slouching is bad for you, and we're not talking about effect it has on your back. Languish in your chair while listening to these striking Diapasons and you won't hear even half of the magic they can deliver. Why? The Astera come with a dedicated pair of stands, and in many ways they're a great match. The supports' metal-and-wood mix works well with the standmounters' chiselled looks. On a technical note, the wood is pretty good at damping the resonances inherent in an rigid metal structure, too. Our issue is with the stands' height. At 77cm (including spikes and top-plate studs), they raise the speakers too high for the average seat. That influences everything from tonal balance – far too dull – to making the bass from the 18cm Nextel-coated paper-coned mid/bass units sound ill-defined and tubby. It doesn't help that these speakers are pretty fussy about positioning, sounding best pointing directly at the listener, and placed away from walls. Minimise these issues by sitting high enough to keep the 29mm silk dome tweeters around ear height and taking plenty of time to optimise the Asteras' position, and you're in for a treat. These speakers make a beautiful sound, even if they do take the edge off aggressive recordings such as Eminem's Recovery. A decent dose of timing and naturally expressive dynamics prevent listening to such music becoming a write-off, though there's always the underlying feeling that the Asteras aren't totally comfortable. They might be well-spoken to a fault, but play something that revels in their refinement and sweet-natured balance, such as Dvorák's New World Symphony, and you're in for a real treat. A wonderfully subtle midrange dovetails into one of the sweetest treble performances around; these speakers are a joy with material like this.You can add an extraordinarily large soundstage onto the Asteras' list of plus points. With an appropriate system – in this case dCS's Puccini CD/SACD player as source and the pricey Aesthetix Calypso Signature/Atlas Monoblocs performing amplification duties – the Asteras project the sound convincingly and have no trouble disappearing into their self-created soundfield. 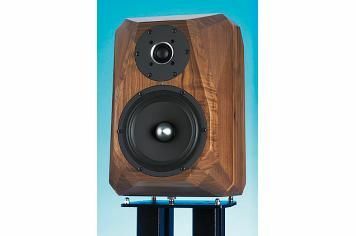 We have no doubt that at least some of this quality is due to the speakers' heavily sculptured cabinets and their sturdy Canaletto Walnut construction. They really are made from slabs of solid tree-wood, too; most rivals use MDF covered with a thin wood veneer instead, which is a far easier and cheaper way of doing things. The Asteras like to be pampered, and even then they aren't the most complete all-rounders that can be had for this kind of money. But take care to get the system and positioning spot-on, and they can serve up the kind of sonic magic (with the right music) that makes every single penny of their hefty price tag seem worthwhile. When a speaker costs as much as this, that really is saying something.